Save The Date! Dec 11th Equality Fair and Holiday Boutique! Happy Holidays! May the season bring you great joy and good cheer! 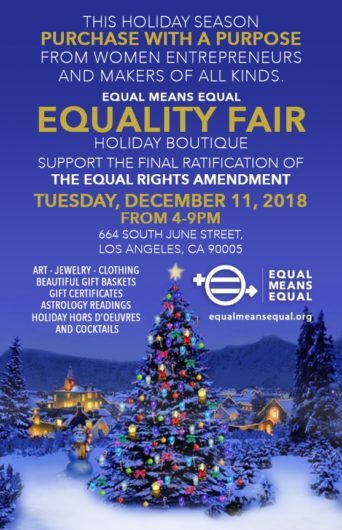 EQUAL MEANS EQUAL would love to invite you, if you happen to be in Los Angeles, to our Equality Fair and Holiday Boutique on Tuesday December 11th from 4-9pm. We will be screening “Legalize Equality” in one room (on a loop) and provide educational materials about ERA to everyone who comes. 20% of all monies raised will be donated to our charity to complete the ratification of ERA in 2019. Come and support women entrepreneurs and makers of all kinds! Art, Jewelry, Clothing, Gift Baskets & Certificates, Astrology Readings and Holiday Hors D’Oeuvres & Cocktails!